Technology has become a double-edged sword for for productivity. As technology advances, follow through and attention to detail seems to slip from our mind and the basics are being forgotten, leading to mistakes that could be avoided by simply following a checklist. Checklists are you addressing failure and following simple steps to avoid future mistakes. Twitter, Facebook, Email, and Mobile devices have creating a new class of tech-consumers that are fairly well educated and savvy to the technology. Businesses have been so focused on adapting to the newest technologies that they’ve forgotten the basic aspects of running their business that got their core customer base to work with them in the first place: checklists, processes, quality control! 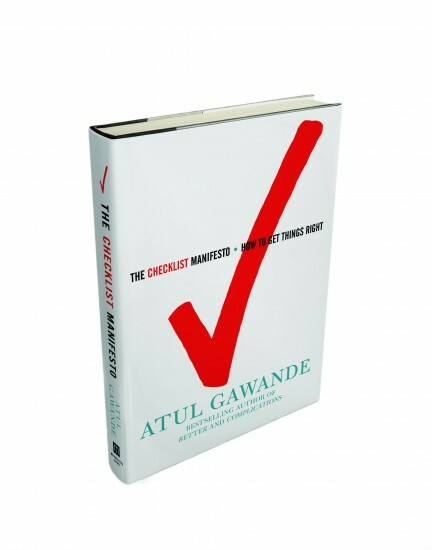 I’ve seen a need for businesses and individuals to migrate back to the basics over the last few months and in my search for more information, I came across The Checklist Manifesto a book by Atul Gawande, a surgeon and -now- author. The book provides a manifesto for getting back to the basics for everyone, even brain surgeons. One of thing that really has stuck with me since reading his book is the fact that he is having trouble presenting these simple ideas in hospitals and businesses. With insurance rates soaring, you’d think that a simple, almost free solution that could improve mortality rates would be popular idea with doctors and hospitals. What Gawande found was that the hospital’s didn’t want to dictate policy to their doctors, for fear of upsetting them, or doctors didn’t want someone coming in and telling them what to do. Their pride told them that went to school for 8+ years, they earned their title, and they shouldn’t have to follow a checklist to complete their job. People are dying because of this! This attitude isn’t just restricted to the medical field. If you are a small business or an entrepreneur, you cannot allow yourself or your team to be poisoned by a false sense of entitlement, or pride. Your actions are representative of your company and will reflected in a customers perception of the company. Next time you’re planning to adapt to new technology, make sure that your basic processes are updated to reflect that change or you’ll rot from the inside-out. You may feel that this has become a little off topic, but what I’m driving at is that the act of using checklists should not be a difficult thing for professionals to adopt. To avoid them is to believe that you are incapable of making mistakes. In which case you are a fool.